Picture of Sabay Vegilicious' founders via their Facebook Page. It’s never too late to make a change, as Cambodian restaurant owners Syna and Mong can attest. The couple decided to shut down their former restaurant, which served dog meat, and opene a new, vegan restaurant – Sabay Vegilicious. “Positive and compassionate at their core, they are striving to leave behind what was often sad and violent in their previous business, and trade it for a friendlier and more compassionate way to earn a living and to support their young children’s education and their own lives,” the owners are described on their Facebook page. Before they opened Sabay Vegilicious in March of 2018, Syna and Mong were like many other Cambodian restaurant owners. They served meat, including dog meat, a common dish in Cambodia and many nearby countries. 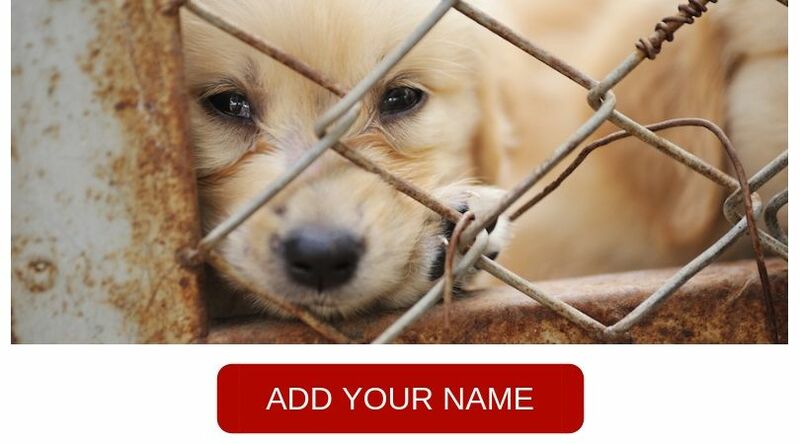 Over 30 million dogs are slaughtered ever year in this often illegal and unregulated trade. The conditions are brutal. Caged in close quarters, beaten, tortured, and left to suffer, the dogs who make it onto people’s plates in Cambodia and other countries where the meat is served lived terrible lives. Yet, the demand exists, which creates an incentive for many restaurant owners to serve the meat, even if the owners don’t agree with the ethics. Syna and Mong finally decided to risk opening a restaurant that doesn’t serve any meat after meeting with Marc Ching, founder of Animal Hope and Wellness Foundation, and receiving start up funds. The new restaurant opened in Phnom Penh in March, 2018. Animal Hope and Wellness Foundation helped not just by giving funds to purchase a new location and equipment, they also provided plant-based cooking training. Now, Syna and Mong stick to a mostly plant-based menu. Not only are these new dishes delicious, they are also guilt-free. Although Sabay Vegilicious is popular with the expats, the idea of a purely plant-based meal may still be a little novel with the locals. Increasing awareness, delicious food, and patronage from caring clientele can go a long way to help Sabay Vegilicious, and other restaurants like it, grow. And, in a bit of a twist, the only dogs you’ll see in Sabay Vegilicious are just hanging out with their human friends and not on anyone’s plate. “We hope that the news of this ethical enterprise spreads far and wide, and that it may inspire other dog-meat businesses to acknowledge the immense reward that comes along with running a compassionate and ethical business,” said Syna and Mong. There is hope. This is a young couple and it is the young people that will change the violent and brutal ways that the older generations still insist on. Way to go . Thank You ! Please help others to do the same.